Chrysalis is a superhero and member of the Justice Force, and an ally of the Ninja Turtles. Chrysalis first appeared in the episode Space Invaders, Part 2, where she is revealed as a resident of India. How exactly she got her powers and came to be initiated into the Justice Force remains unknown. Her powers are very similar to the Marvel comics character Songbird. Chrysalis, along with her Justice Force comrades, was part of the Turtles’ attack force against the Tengu Shredder. Chrysalis appears in the episode The Journal. Chrysalis appeared in the episode Super Power Struggle. Chrysalis attended Casey and and April’s wedding in the episode Wedding Bells and Bytes, though she and the rest of the Justice Force had to rescue the wedding party from an attack by the Foot and the Cyber Shredder before the ceremony could be concluded. Chrysalis is capable of creating an energy field which acts as a force similar to psychic telekinesis. 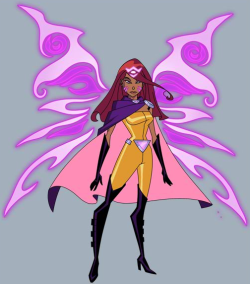 She can form wings for flight, project energy blasts, and manipulate objects with her mind power at will. During the Triceraton invasion on Earth, for instance, she dismantled a Triceraton fighter with her power, causing it to fall apart in its component pieces.